First of all, Happy Halloween! I’ll be partying all day at the day program I work at and then handing out candy to the kids in our neighborhood tonight. I’m actually excited because this is the first year I’ll actually live somewhere where I can pass out candy to the Trick-or-Treaters, so I’m looking forward to that. What are your Halloween plans? I’ve been super busy this week trying to finish up my Halloween costume in my free time and prepare for our party this Friday. I also decided to sell at the Halcyon craft fair next weekend, which was a last-minute decision but I think it might be a good way to make a little extra money for Christmas presents. My mom is making some things to sell and I’m going to throw in some vintage stuff so I don’t get stressed out trying to make a bunch of stuff to fill the booth. If you’re curious, here are my posts from the last couple times I sold at this fair: one, two. The platter here was my one thrift store find for the week. It’s called Raffia by Vernon Kilns. I thought it would make a great Fall-themed serving dish for Thanksgiving. I’m debating if I should keep it or put it in the antique booth. 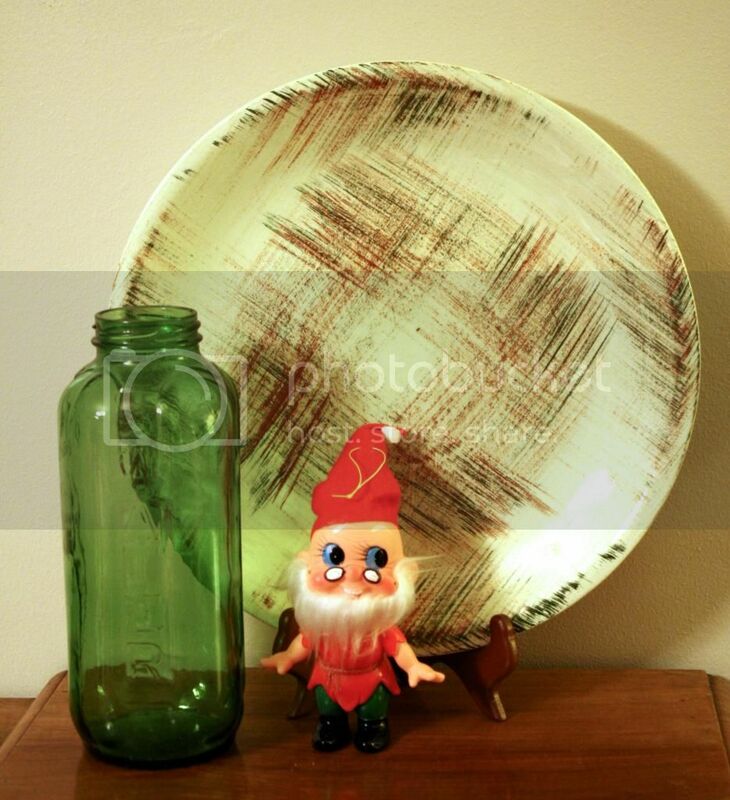 The bottle and the elf are from a yard sale we went to. 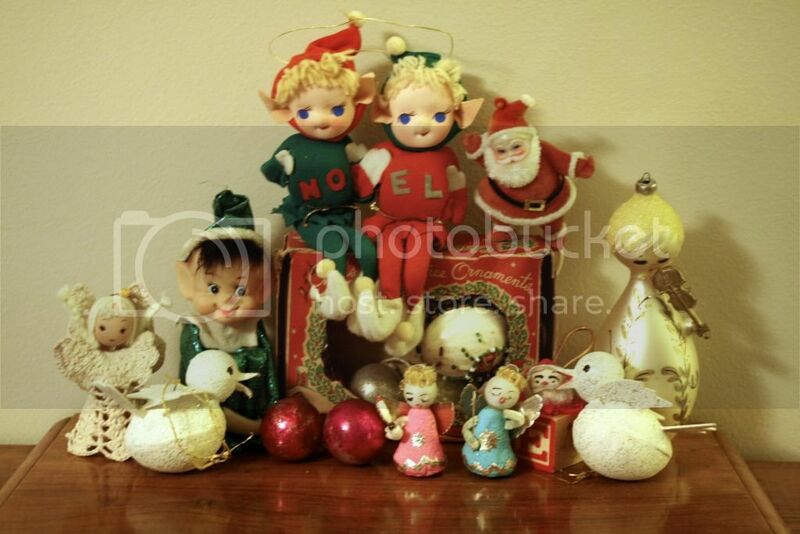 All of these vintage Christmas ornaments are from yet another yard sale. They didn’t have much else worth buying, but we sure found a lot of great Christmas stuff! It’s all headed for the antique space in a month or so, and I might try to sell some at the craft fair next weekend to round out my handmade items. 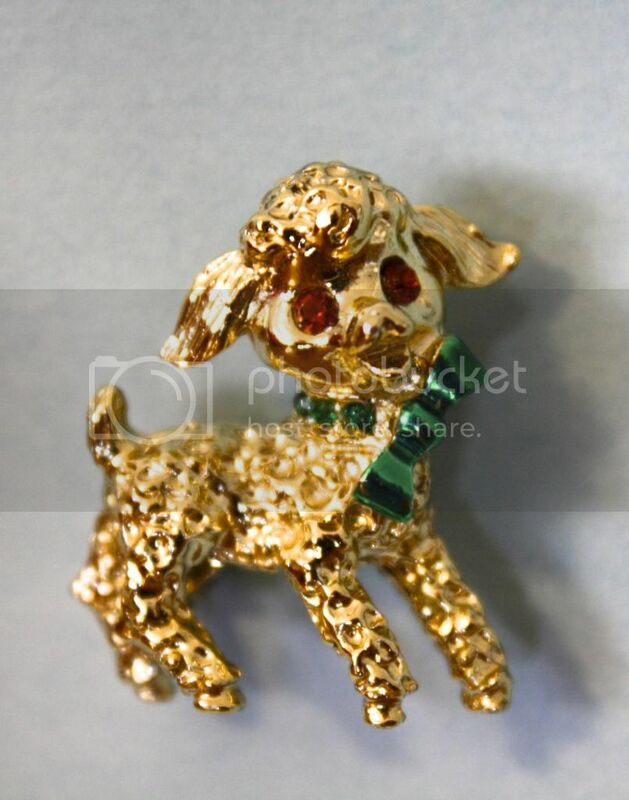 This little lamb pin was a great estate sale find for $3! I found some great Pyrex this weekend too! Three red bowls (always a popular color) and a Friendship pattern bowl. 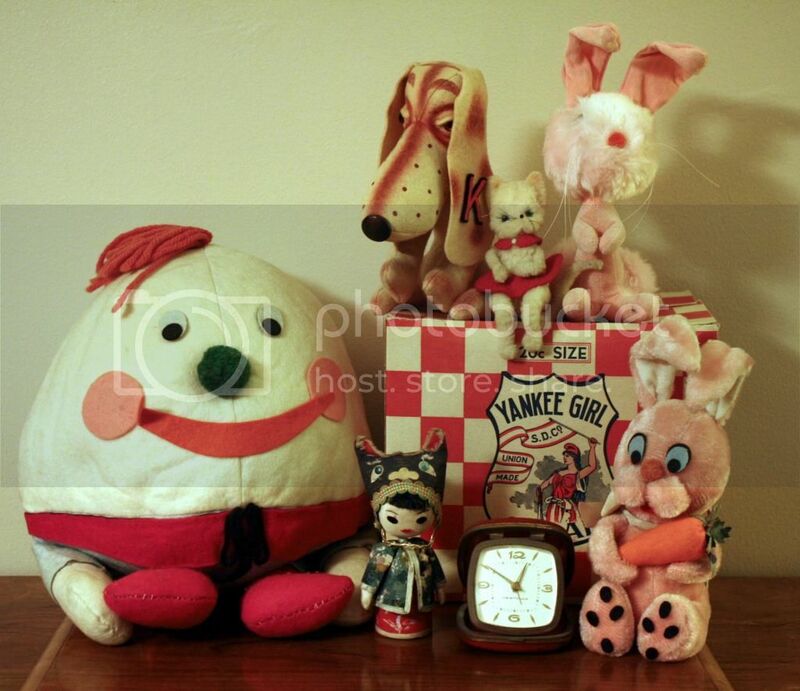 We also found this great mechanical Easter Bunny that drinks carrot juice (though the battery compartment is shot, so we just have to imagine his movement), this very sixties angel tree-topper, a recipe box, and this great cook book. It’s got the most adorable illustrations! I’m adding it to my collection of inspiring vintage artwork (along with my Charley Harper cookbook). 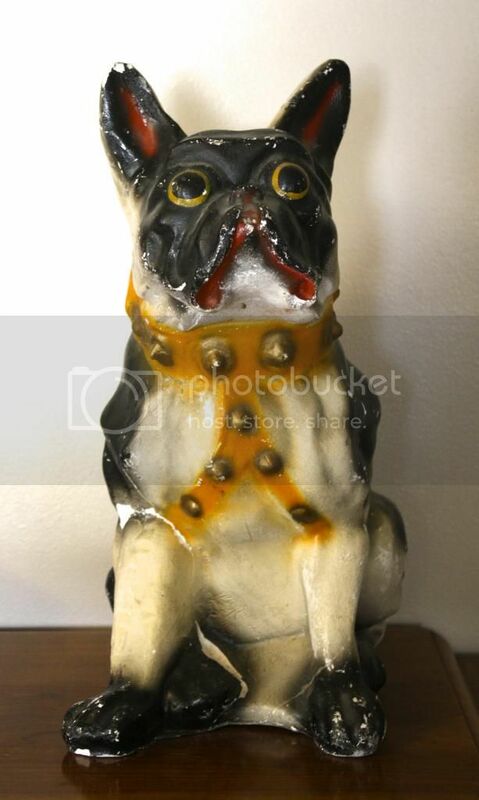 Phillip’s favorite find of the weekend was this chalkware dog (which he estimates is from the 1930s or so). It has a broken leg, and as a result he got a really great deal on it. It has a new home on our fireplace. 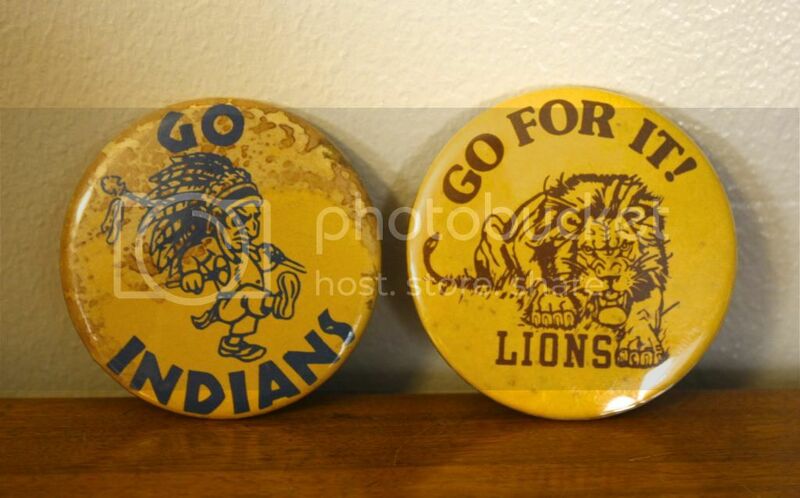 Lastly, we found this little school mascot buttons, which Phillip has listed on ebay. Thanks for checking out this week’s Thrifty Thursday! As usual, I’ll be linking up at Apron Thrift Girl, A Living Space, Sir Thrift A Lot, and Joyful Treasure Hunting, so head on over and check out what everyone discovered this week!